Walter Neff first appears during early morning darkness. The hat is pulled low, as if hiding pockmarks. Over his shoulders, his overcoat resembles a cloak. Corruption infects. Caught in a bubonic nightmare, victim Neff uses the phonograph to relate the tragedy, a consequence of his own appetites and the treachery of a woman. His narrative method echoes those episodes of Dracula that were also recorded on a phonograph. It emphasises the notion of corruption as infection. This is a man seduced by modernity and the New World. Neff is not like his colleague, Barton Keyes, the narrow administrator who only lives to work and expose lies. Neff wants more, California sunshine and a beautiful woman. But if modernity promises freedom and pleasure, it will also judge. Technology will record for posterity, through photographs and recordings, shabby desires. Film noir exposes male paranoia and serves as the classic cop-out for modern man. His will weakened by the distractions of consumerism, the male blames the woman for urging him to want more. Neff plans the murder yet the camera repeatedly focuses on the evil expression on the face of Phyllis, his accomplice. She is a psychopath, and Neff is unlucky to meet her, but he is the architect of what happens. He deserves his fate except nobody does because fate is too damned arbitrary. On another day, Neff would have accepted the offer from Keyes to become a claims manager, taken his limitations away from the outside world and temptation. No wonder his mentor is called Keyes. He offers an alternative to fulfilment, and it is called survival. The similarity between Barton Keyes and Billy Wilder cannot be ignored. Both are overweight men, short in stature and physical appeal. Nobody doubts the talent of Wilder but some have criticised his misanthropic cynicism. They allege he lacks the status of an auteur and that Wilder is a sophisticated entertainer without artistic ambition. Cynicism, though, can exist in the narrow moralist. Keyes works hard not to impress his bosses but to prove he has integrity. He swaps a life for expertise. The price is lost opportunities and a reduced existence but the reward is self-respect. Wilder worked to his own professional standards. He was not tempted by the ambitions of the self-conscious artist. He acquired economic security and was recognised for mastery. Walter Neff has desires beyond those of Keyes. His ambition exceeds the need to survive. But he understands the worth that exists in Keyes, which means that Neff is well aware of the price paid by Keyes. This is why Neff is so vulnerable to temptation. The existence of lines in Double Indemnity is important. Railway lines, the strange meetings in the local supermarket that take place between lines of groceries and the two lines of wood that support Neff as he walks to the train. ‘No getting off until the end of the line,’ is said more than once. No matter how beautiful the woman, there is no freedom. Self-control is essential. Howard Jackson has written three books that have been published by Red Rattle Books. These are Treat Me Nice, Innocent Mosquitoes and No Money Honey. If you want to read more about American culture click here. 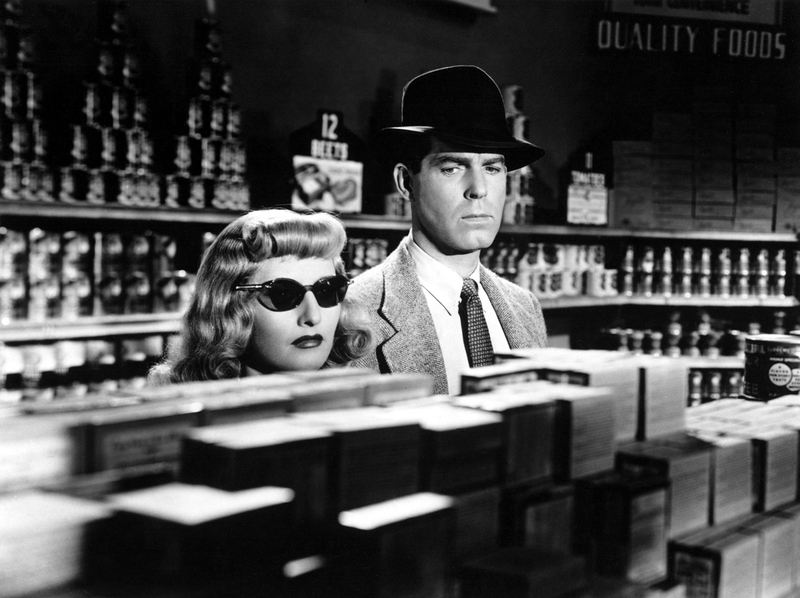 Posted in Film, Film Noir, Reviews and tagged cinema, Double Indemnity, film, film noir, movies on July 6, 2014 by Howard Jackson.